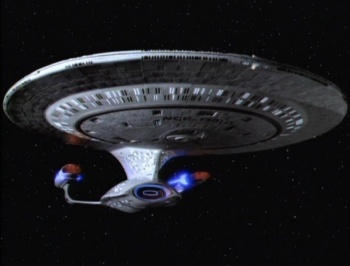 DARPA has requested help from the general public to figure out how to make Star Trek a reality. If you haven't heard, the Defense Advance Research Projects Agency (DARPA) partnered up with NASA in 2010 to begin a project called the 100-Year Starship Study which aims to develop a practical, realistic model for long-term space travel. It might look easy in Star Trek, but figuring out how to fly across the stars for decades without making a pit-stop is no cakewalk. To acquire some ideas that might be outside the box, DARPA put out an open call to the public. DARPA says it's "seeking ideas for an organization, business model and approach appropriate for a self-sustaining investment vehicle in support of the 100 Year Starship Study." The project aimed at making long-distance space travel "practicable and feasible" encompasses a "myriad of disciplines" that must be considered. The call was put out to anyone from students, to researchers, to scientists, to astronomers, to ditch-diggers. DARPA's goal is to use as many ideas as possible to discover what would truly be needed for long duration, long distance spaceflight for "planning and acquisition strategy development." The underlying theme here is that a 100-year journey through space would cost a lot of money. It isn't just about figuring out how to keep a crew alive for decades, but how exactly to pay for such a feat. Planetside, DARPA believes the 100-Year Starship Study will have benefits for mankind in areas such as propulsion, life support, navigation, and more. If anybody out there knows how to build a decent replicator, go here.